Gift Baskets are timeless and never go out of style. They can be designed to suite any occasion and for couples, men or women. They can be personalized to make it all the more meaningful to the recipient. Unlike sending flowers, a Gift Basket allows you to send so much more in one elegant package! They come in countless shapes and sizes from traditional wicker to cardboard for those visiting/staying at a hotel. They can contain the finest in gourmet foods to ‘fun’ snacks such as chips,candy. 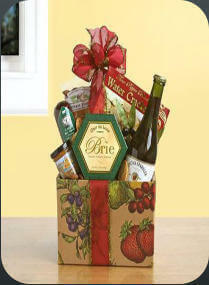 As for beverages, can include anything from water/soft drinks to fine wine, beer and Champagne Gift Baskets. Gift Baskets are Lasting. Except for perishable foods, the contents can last for weeks. Also the wicker baskets can be re-purposed. Gift Baskets are Sharable. They can contain enough product to send to more then one person. 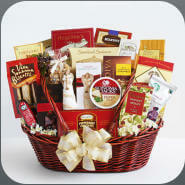 So when only the best will do, Let Demi’s Gift Baskets design your next Gift Basket for that special someone!